A Christmas card containing a greeting in Irish that was sent out to members of a predominantly unionist council has been branded “divisive” by a DUP councillor. The card, sent out by Sinn Fein Mayor Brenda Chivers to her fellow councillors on Causeway Coast and Glens Council, reads ‘Nollaig Shona’ or ‘Happy Christmas’ on the front, with bilingual messages inside. DUP Alderman Sam Cole said the decision to only use Irish on the front was “not inclusive” and felt some would take the mayoral gesture as an “insult”. The Garvagh man also accused the mayor of “bringing politics into Christmas”. He told the News Letter: “This is the first time I have received a Christmas card that I couldn’t read, and am I sure many others who received it would be in the same position. “It was in bad taste to send out a Christmas card using a divisive language, because that is what Irish has become, whether we like it or not. “We have no government in NI because Sinn Fein have put a red line down for an Irish language act. So to use it in an exclusive way, rather than inclusive, was a step too far in my opinion. 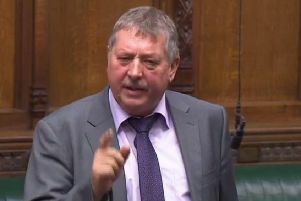 Echoing his party colleague’s remarks, DUP North Antrim MLA Mervyn Storey said this “blows a hole through the narrative that Sinn Fein want Irish and English to be treated equally”. He added: “This is one of many examples where Sinn Fein have used the language in a political context. You see this in places like Mid Ulster, where Irish is used first on welcome signs and English second. The language is clearly being used by Sinn Fein as a political tool. UUP councillor William McCandless accused Ms Chivers of “abusing her privilege as mayor”. “I hate the see the Irish language politicised, especially at this time of the year, a time for reconciliation and peace,” he said. She also dismissed claims that the cards could not be understood as “nonsense”, stating they are “clearly bilingual” inside. In a statement, the mayor expressed her “disappointment” that her “gesture of goodwill” had met with a negative response from some unionists. “The Irish language is part of our shared history and culture on this island but, unfortunately, some still seem unable to accept that reality and are unable to treat the language with respect,” she added.